Your leaving date is fast approaching, the butterflies in your stomach are starting to kick in and you feel the need to start “getting bits ready” so it starts to feel more real and you have a reason to be excited. However, when that time comes, the question on every backpackers mind is what do I pack? And how? I’ve got this wrong so many times and hope to learn from my previous mistakes of completely panic overpacking. The first time I went to Thailand for just one month, of course I thought better get a backpack! A backpack that I filled to the brim, struggled to keep shut – for just ONE month. One month just visiting the islands too, so all I really needed was a few bikinis and shorts. It’s funny looking back now, but as that was my first real “big” trip I left ridiculously prepared for any situation that may arise. I was basically a human walking pharmacy. The amount of toiletries I had packed was insane, two lots of everything. What was I thinking? Little did I know there was a boots located right on Khao San road I could have easily brought it all from when I got there. I did learn from that packing error the second time I went though. This time it was my big year long trip. I wasn’t just visiting sunny climates, I was heading to New Zealand which before I went I imagined it to be cold and rainy all the time (I was wrong!) I took a similar size backpack to the one I took before, which makes no sense at all considering I only went for a month, this time it was 12!? I cut down on toiletries, sort of. I had to keep reminding myself that if I ran out of toothpaste it’s not the end of the world, I’m not heading to a third world country, I’m pretty sure they’ll be a supermarket in Australia. Of course, there was and I was fine. Half way through that year I realised I hadn’t even touched some of my clothes that were located right at the bottom of my bag, some clothes I just didn’t need and was carrying them around for the sake of it. This is what you shouldn’t do! Learn from this and remember when packing in the first place, if you know you won’t wear it within the first 2 weeks then don’t pack it. Don’t even worry about packing a “party dress” or heels incase there’s a night out . You are a backpacker, you have the right to pull off that hippy/haven’t even thought about what to wear look. When you’re on the road, no one cares if you’re wearing this seasons dress from Topshop, that’s the beauty of travelling. None of the materialistic image matters anymore, remember -you’re free! It totally depends where you’re going of course for the type of clothes you pack, but the majority of the time when people travel from England it’s to go to warmer climates. If so, do not over pack, it’s so not worth it and you won’t even wear half the stuff. Also there’s so many cool boutique market shops all around the world where you can buy one of a kind stuff. So my advice; wait until you’re there to splash out on new clobber. My expertise advise for packing toiletries is just take what you would when you’re going away for a weekend. I know that might sound obscene for some people but seriously , you’re not travelling to the moon. Things you SHOULD pack; Chargers, for phones, laptops etc. Travel adapters; nowadays you can buy the all in one adapter that does every country which is nice and handy. Suncream; I know you could buy this out there but just incase you land in the mid day heat and you’re walking round for hours trying to find a hostel – believe me it might save you looking like a lobster the next day. And of course the most important thing is your passport, you’ll certainly be needing that! 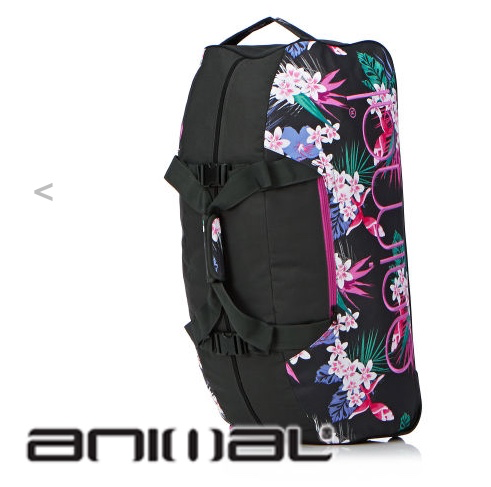 This is the bag below I have brought for my next trip… I’ll give a review of it once I’m on the road.